Senior Director’s Seat — Watershed Productions Inc.
During the first week of this hands-on program participants pitch, script, and direct their own short films using professional camera and sound gear. 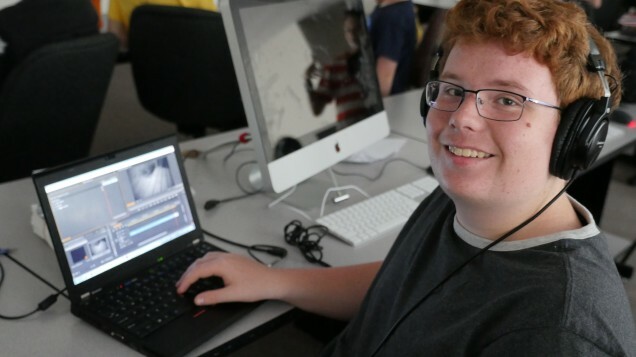 Once production is complete, the focus turns to editing, where participants learn advanced editing techniques using Adobe Premiere Pro and After Effects An emphasis on collaboration, responsibility and critical thinking run through all aspects of this intensive two week program. Participants do not need any gear or equipment to participate, but previous experience with video is preferred. For families who need various levels of financial assistance, there is a bursary program for 2019 film camps. Upon registering for your particular program, you must let the administrative staff at Selkirk College/Kootenay School of the Arts know you are interested in receiving a bursary. Bursaries are first come, first serve and are offered up $100 off the total program cost for families who demonstrate need. Receipt of this bursary is contingent upon approval by the Selkirk College administrator. To Register in person: Visit the Selkirk College/KSA office at 606 Victoria Street Monday-Friday 8:30am-4:00pm. Office is closed 1-2PM for lunch.